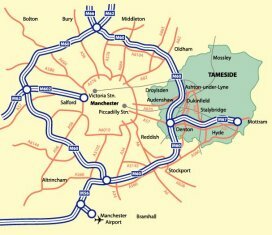 Lying seven miles due east of Manchester, in the North West region of England, Tameside is a neat, compact Borough in an area of scenic beauty, industrial heritage and easy communication with the rest of the country. 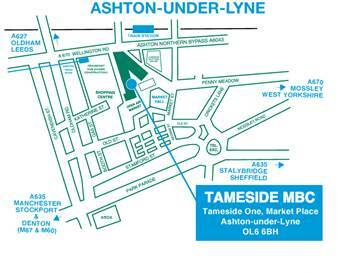 Our Customer Service Centre is located at Tameside One which is located at Market Place, Ashton under Lyne, OL6 6BH, the map below illustrates how to find us. Here you can get in depth specialist advice on Housing Benefit and Council Tax issues plus help with Disability Living Allowance and Personal Independence Payment application forms. An appointment will be required for any Disability Living Allowance or Personal Independence Payment application but there is no need to make an appointment for any other enquiry. To make an appointment you can call into Tameside One or telephone 0161 342 8355.